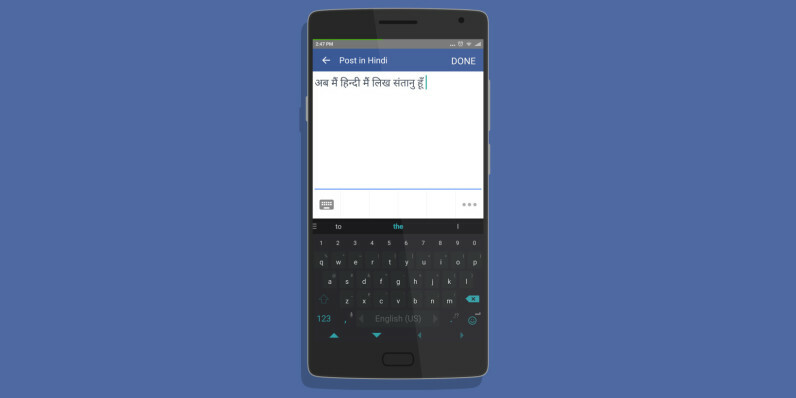 The latest version of Facebook’s Android app has a treat for users who converse in Hindi – an all-new transliteration feature. The app now lets you type Hindi posts and comments using an English keyboard, negating the need to download separate language packs or switch between them. The latest version adds a button below the text field when you’re typing a post. Tap it to launch the Hindi editor and type your message using the English keyboard, and Facebook will automatically transliterate the Roman characters to Hindi script. The company says it built the feature in response to feedback from users who wanted an easier way to write in their native Hindi script on the social network. It adds that it’s not yet perfect and you might encounter the ocassional error. That’s why there’s also there’s also a visual keyboard with Devanagari characters so you can correct mistakes and spell out proper nouns that aren’t recognized. The new editor will also remember the suggestions you use the most. It’s available in India now, so you can try it by updating to the latest version of Facebook on Android.